The great Presiding One, who sits within the Council Chamber of the Lord, spoke to the Teacher, standing by his side: "Where is the son of man who is the son of God? How fares he? How is he tested and with what service is he now engaged?" The Teacher said, casting his eye upon the son of man who is a son of God: "Naught at this time, O great Presiding One. The third great test provided much of teaching sustenance to a learner such as he. He ponders and reflects." "Provide a test which will evoke his wisest choice. Send him to labour in a field wherein he must decide which voice, of all the many voices, will arouse the obedience of his heart. Provide likewise a test of great simplicity upon the outer plane, and yet a test which will awaken, on the inner side of life, the fulness of his wisdom and the rightness of his power to choose. Let him proceed with the fourth test." Before the fourth great Gate stood Hercules; a son of man and yet a son of God. At first was silence deep. He uttered not a word or made a sound. Beyond the Gate the landscape stretched in contours fair and on the far horizon stood the temple of the Lord, the shrine of the Sun-God, the gleaming battlements. Upon a hill nearby there stood a slender fawn. And Hercules, who is a son of man and yet a son of God, both watched and listened and, listening, heard a voice. The voice came out from that bright circle of the moon which is the home of Artemis. And Artemis, the fair, spoke words of warning to the son of man. "The doe is mine, so touch it not," she said. "For ages long I nurtured it and tended it when young. The doe is mine and mine it must remain." Then into view Diana sprang, the huntress of the heavens, the daughter of the sun. Leaping on sandalled feet towards the doe, she likewise claimed possession. "Not so," she said, "Artemis, fairest maid; the doe is mine and mine it must remain. Too young until today, it now can be of use. The golden antlered hind is mine, not yours, and mine it shall remain." Hercules, standing between the pillars of the Gate, listened and heard the quarrel, and wondered much as the two maidens strove for possession of the doe. Another voice fell on his ear, and with commanding accents said: "The doe belongs to neither maid, O Hercules, but to the God whose shrine you see on yonder distant mount. Go rescue it and bear it to the safety of the shrine, and leave it there. A simple thing to do, O son of man, yet (and ponder well my words) being a son of God, you thus can seek and hold the doe. Go forth." Through the fourth Gate sprang Hercules, leaving behind the many gifts received and cumbered not himself in the swift chase which lay ahead. And from a distance the quarrelling maidens watched. Artemis, the fair, bending from out the moon and Diana, beauteous huntress of the woods of God, followed the movements of the doe and, when due cause arose, they each deluded Hercules, seeking to foil his efforts. He chased the doe from point to point and each with subtlety deceived him. And this they did, time and again. Thus for the length of a full year, the son of man who is a son of God followed the doe from place to place, catching swift glimpses of its form, only to find that in the fastness of the deep woods it had been lost. From hill to hill and wood to wood, he hunted it until close to a quiet pool, full-length upon the untrampled grass, he saw it sleeping, wearied with its flight. With quiet step, outstretched hand and steadfast eye, he shot an arrow towards the doe and in its foot he wounded it. Exciting all the will of which he was possessed, he nearer drew and yet the doe moved not. Thus he drew close, and clasped the doe within his arms, close to his heart. And Artemis and fair Diana both looked on. "The search is o'er", he chanted loud. "Into the northern darkness I was led, and found no doe. Into the deep dark woods I fought my way, but found no doe; and over dreary plains and arid wilderness and deserts wild, I struggled towards the doe, yet found it not. At each point reached, the maidens turned my steps, but still I did persist and now the doe is mine! the doe is mine!" "Not so, O Hercules," came to his ears the voice of one who stands close to the great Presiding One within the Council Chamber of the Lord. "The doe belongs not to a son of man, e'en though a son of God. Carry the doe to yonder distant shrine, where dwell the sons of God and leave it there with them." "Why so, O Teacher wise? The doe is mine; mine by long search and travel, and mine likewise because I hold the doe close to my heart." "And are you not a son of God, although a son of man? And is the shrine not also your abode? And share you not the life of all who dwell therein? Bear to the shrine of God the sacred doe, and leave it there, O son of God." Then to the holy shrine of Mykenae, Hercules bore the doe, carrying it to the center of the holy place and there he laid it down. And as he laid it down before the Lord, he noted on its foot the wound, made by an arrow from the bow he had possessed and used. The doe was his by right of search. The doe was his by right of skill and the prowess of his arm. "The doe is therefore doubly mine," he said. But Artemis, standing within the outer court of that most holy place heard his loud cry of victory and said: "Not so. The doe is mine and always has been mine. I saw its form, reflected in the water; I heard its feet upon the ways of earth; I know the doe is mine, for every form is mine." The Sun-God spoke, from out the holy place. "The doe is mine, not yours, O Artemis! Its spirit rests with me from all eternity, here in the center of the holy shrine. You may not enter here, O Artemis, but know I speak the truth. Diana, that fair huntress of the Lord, may enter for a moment and tell you what she sees." Into the shrine for one brief moment passed the huntress of the Lord and saw the form of that which was the doe, lying before the altar, seeming dead. And in distress she said: "But if its spirit rests with thee, O great Apollo, noble son of God, then know the doe is dead. The doe is slain by the man who is a son of man, e'en though a son of God. Why may he pass within the shrine and we await the doe out here?" "Because he bore the doe within his arms, close to his heart, and in the holy place the doe finds rest, and so does man. All men are mine. The doe is likewise mine, not yours, nor man's but mine." And Hercules, returning from the test, passed through the Gate again and found his way, back to the teacher of his life. "I have fulfiled the task, set by the great Presiding One. Simple it was, except for length of time and wariness of search. I listened not to those who made their claim, nor faltered on, the Way. The doe is in the holy place, close to the heart of God and likewise, in the hour of need, close to my heart also." "Go look again, O Hercules, my son, between the pillars of the Gate." And Hercules obeyed. Beyond the Gate, the landscape stretched in contours fair and on the far horizon stood the temple of the Lord, the shrine of the Sun-God, with glistening battlements, whilst on a nearby hill there stood a slender fawn. "Did I perform the test, O Teacher wise? The fawn is back upon the hill where I earlier saw it stand." And from the Council Chamber of the Lord, where sits the great Presiding One, there came a voice: "Again and yet again must all the sons of men, who are the sons of God, seek for the golden antlered fawn and bear it to the holy place; again and yet again." Then said the Teacher to the son of man who is a son of God: "labour the fourth is over, and from the nature of the test and from the nature of the doe, frequent must be the search. Forget this not, but ponder on the lesson learnt." Cancer is the last of what we might call the four preparatory signs, whether we are considering the involution of the soul in matter, or the evolution of the aspirant as he struggles out of the human into the spiritual Kingdom. Being equipped with the faculty of mind, in Aries, and with desire, in Taurus, and having arrived at the realization of his essential duality, in Gemini, the incarnating human being enters, through birth in Cancer, into the human kingdom. Cancer is a mass sign, and the influences which pour from it are held by many esotericists to bring about the formation of the human family, of the race, the nation, and the family unit. Where the aspirant is concerned, the story is somewhat different, for in these four signs, he prepares his equipment and learns to utilize it. In Aries, he grips his mind and seeks to bend it to his need, learning mental control. In Taurus, "the mother of illumination", he receives his first flash of that spiritual light which will grow increasingly more brilliant as he nears his goal. In Gemini, he not only appreciates the two aspects of his nature, but the immortal aspect begins to increase at the expense of the mortal. Now, in Cancer, he gets his first touch of that more universal sense which is the higher aspect of the mass consciousness. Equipped, therefore, with a controlled mind, a capacity to register illumination, an ability to contact his immortal aspect and intuitively to recognize the kingdom of spirit, he is ready now for the greater work. In the next four signs, which we might regard as the signs of physical plane struggle for achievement, we have portrayed for us the tremendous battle through the medium of which the Self-conscious individual, emerging out of the mass in Cancer, knows himself to be the individual in Leo, the potential Christ in Virgo, the aspirant endeavoring to balance the pairs of opposites in Libra, and the one who overcomes illusion, in Scorpio. These are the four signs of crisis and of stupendous endeavor. In them all the illumination, intuition and soul power of which Hercules, the aspirant, is capable, are utilized to the uttermost. These have their reflection, too, on the involutionary arc, and a similar sequence of unfoldment can be traced. The soul achieves individuality in Leo, becomes the nurturer of ideas and of potential capacities in Virgo, swings violently from one extreme to the other in Libra, and is subjected to the disciplining effect of the world of illusion and form in Scorpio. In the final four signs, we have the signs of achievement. The aspirant has worked out of the world of glamor and of form, and in his consciousness is free from their limitations. Now he can be the archer in Sagittarius, going straight for his goal; now he can be the goat in Capricorn, scaling the mount of initiation; now he can be the world worker in Aquarius, and the world savior in Pisces. Thus he can sum up in himself all the gains of the preparatory period and of the fiercely fought battles in the four signs of strenuous activity; and in these four final signs demonstrate the gains achieved and the powers developed. This brief summation of the signs, as they affect Hercules, will serve to give some idea of the wonderful synthesis of the picture, and of the steady progression, and of the controlled unfolding of the various forces which play their subtle parts in bringing about the changes in the life of man. Three words summarize the objective self-awareness or the conscious aspect of the evolving human being: instinct, intellect, intuition. The sign which we are now studying is predominantly the sign of instinct; but the sublimation of instinct is the intuition. In the same way, as matter has to be lifted up into heaven, so instinct has to be likewise lifted up, and when it has been thus transcended and transmuted, it manifests as intuition (symbolized by the doe). The intermediate stage is that of the intellect. The great need of Hercules now is to develop his intuition and to become familiar with that instantaneous recognition of truth and reality which is the high prerogative and potent factor in the life of a liberated son of God. Eurystheus, therefore, sent Hercules to capture the golden horned Keryneian doe or hind. The word "hind" comes from an old Gothic word, meaning "that which must be seized", in other words, that which is elusive and difficult to secure. This doe was sacred to Artemis, the goddess of the moon; but Diana, the huntress of the heavens, the daughter of the sun, also claimed it and there was a quarrel as to ownership. Hercules accepted the charge of Eurystheus and set out to capture the gentle hind. He was a whole year hunting it, going from one forest to another, just catching sight of it and then again losing it. Month after month went by, and he never could catch and hold it. Success at last crowned his efforts and he seized the doe, flung it over his shoulder, "held it close to his heart", and carried it to the sacred temple at Mykenae, where he laid it down before the altar, in the holy place. Then he stood back, pleased with his success. This is one of the shortest of the stories but though we are told very little, this labour, when considered thoughtfully, is one of profound and outstanding interest and the lesson it holds is of deep import. There is no success for the aspirant until he has transmuted instinct into intuition, nor is there right use of the intellect until the intuition is brought into play, interpreting and extending the intellect and bringing realization. Then instinct is subordinated to both. 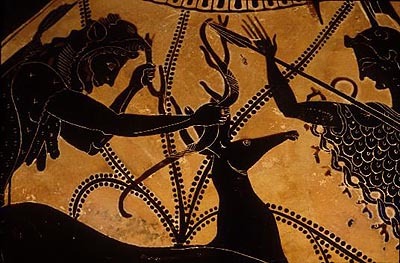 Cancer is called the Crab and the Greeks tell us that it was the crab that was sent by Hera to bite the foot of Hercules. (Again we meet this symbol in the vulnerable "heel of Achilles".) This is an interesting way of expressing the liabilities of the incarnation process and of illustrating the handicaps which beset the soul as it travels along the path of evolution. It symbolizes the limitations of all physical incarnation, for Cancer is one of the two great gates of the zodiac. It is the gate into the world of forms, into physical incarnation, and the sign wherein the duality of form and of soul is unified in the physical body. The opposite sign to Cancer is Capricorn, and these two constitute the two gates, one being the gate into form life, and the other into spiritual life; one opening the door into the mass form of the human family, and the other into the universal state of consciousness, which is the Kingdom of spirit. One marks the beginning of human experience on the physical plane, the other marks its climax. One signifies potentiality, and the other consummation. Jesus gives to Peter ... the keys to the two principal gates of the zodiac, which are the two solsticial points, the zodiacal signs Cancer and Capricorn, called the gates of the sun. Through Cancer, or the 'gate of man', the soul descends upon earth (to unite with the body), which is its spiritual death. Through Capricorn, the 'gate of the gods', it reascends to heaven. - E. Valentia Straiton, The Celestial Ship of the North Vol. II, p. 206. In the zodiac of Denderah, the sign Cancer is represented by a beetle, called in Egypt, the scarab. The word "scarab" means "only begotten"; it stands, therefore, for birth into incarnation, or, in relation to the aspirant, for the new birth. The month of June, in ancient Egypt was called "meore", which again means "rebirth", and thus both the sign and the name hold steadily before us the thought of the taking of form and of coming in physical incarnation. In an ancient zodiac in India, dated about 400 B.C., the sign is represented again by a beetle. The Chinese called this sign "the red bird", for red is the symbol of desire, and the bird is the symbol of that flashing forth into incarnation and of appearance in time and space. The bird appears quite frequently in the zodiac and mythological stories, Hamsa, the bird of the Hindu tradition, "the bird out of time and space", stands equally for the manifestation of God and of man. Out of the darkness flashes the bird and flies across the horizon in the light of the day, disappearing again into the darkness. Our word, "goose", comes from the same Sanskrit root, through the Icelandic, and when we say, "What a goose you are", we are really making a most esoteric affirmation; we are saying to another human being: "You are, the bird out of time and space, you are the soul taking form; you are God in incarnation!" The crab lives half on the earth, and half in the water. It the sign, therefore, of the soul dwelling in the physical body but predominantly living in the water, which is the symbol of the emotional, feeling nature. Exoterically Cancer is ruled by the moon, which is always the mother of form, controlling the waters and the tides. Therefore, in this sign the form is dominant, and constitutes a handicap. The crab builds its house or shell and carries it upon its back, and people born in this sign are always conscious of that which they have built; they are usually over-sensitive, over-emotional, ever seeking to hide away. The Cancer native is so sensitive that he is difficult to handle and so elusive and sometimes so indefinite, that it is hard to understand him or to pin him down. There are eighty-three stars in this sign, the brightest of which is of the third magnitude, and in the very center of the constellation there is a cluster of stars; Praesepe, the manger, called by modern astronomers, "the beehive". The latter is a marvellous symbol of the collective organization of the human family, and is one of the reasons why this is always regarded as a mass sign. In the mass, instinct rules; therefore, Cancer is the sign of instinct, of herd life, of mass reaction. It represents the subconscious mind, hereditary instinct, and the collective imagination. It stands, individually, for the totality of the life and the consciousness of the cells in the body, and of that instinctive, collective life, which is largely subconscious in man, but which always influences his physical body and, subjectively, his lower mind and emotional being. The unevolved Cancer native is immersed in the mass; he is an unconscious part of the great whole, and therein lies the problem; for the average Cancer person, as well as for the aspirant who is performing the labour of this sign, is subjected to the urge to lift himself up out of the mass to which he is held, by his instinct, and to develop instead the intuition, which will enable him so to rise. This sign is sometimes called "the coffin", by the Hebrews, because it marks loss of identity, whilst, the early Christians called it "the grave of Lazarus", who was raised from the dead. In these words, "coffin", "grave", "crab", and in the reference which we sometimes find to Cancer as "the womb", we have the thought of hidden life, of a veiling form, of potentiality, and of that struggle with circumstances which will eventually produce, in Leo, the emergence of the individual and, in Capricorn, the birth of a world savior. Definitely, therefore, it portrays the struggle that goes on in the life of the aspirant so that instinct can give place eventually to intuition. It is interesting to contrast the two signs, Cancer and Capricorn, for that which is indicated in Cancer is consummated in Capricorn. Cancer represents the home, the mother. It is personal and emotional, whilst Capricorn represents the group which the unit consciously enters, and also "the father of all that is". The gate of Cancer is entered through the process of transference out of the animal state of consciousness into the human, whilst the gate of Capricorn is entered through initiation. One is inevitable, subconscious and potential; the other is self-initiated, self-conscious and potent. Cancer represents the mass form, the collective animal soul; Capricorn represents the group, the universal soul. The birthday of the infant Jesus, being arbitrarily set by the priests, produces a serious discrepancy, as we are told he was born in a manger. The manger is found in the sign of the summer solstice, the constellation Cancer, which was called the gate of the sun through which souls were said to descend from their heavenly home to earth, just as at the winter solstice in December, they were said to return to their heavenly or celestial home, the constellation Capricorn, the other gate of the sun. Capricorn was the sign from which sungods were said to the born at the winter solstice and made sacred to the sons of light. - E. Valentia Straiton, The Celestial Ship of the North, Vol. II, p. 205. Someone has used the following words to express the cadence of Cancer when first entered: "A sorrowful little voice underground, a low, half-captured, half-evasive melody." Jesus is often called the Good Shepherd, and he has been depicted many times as the shepherd leading his sheep. The thought of the sheepfold has been closely associated in the minds of people with Christ. Connected with the sign Cancer are three constellations: Ursa Major, Ursa Minor and Argo. The common occidental names for the two former are the Great Bear and the Little Bear, but it is one of the mysteries of astronomy as to how the name "bear" came to be associated with either of these groups of stars, for in the Chaldean, Persian, Indian and Egyptian zodiacs, no bear is found. The names most commonly use are those of "the sheepfold", or "the flock of sheep," and an analysis of the Hebrew and Arabic names for the stars found in these constellations will be found to prove the fact that the ancient names signify "the lesser flock", "the sheepfold", "the sheep", and "the ship". In the thirty-fourth chapter of Ezekiel and in the tenth chapter of St. John, is much that has reference to these constellations. Ursa Minor is famous because the brightest star in it is the pole star, the north star. In the symbolism of these two constellations we have held before us the thought of the mass or group, which is the significant influence of the work carried forward in the sign Cancer, and in the symbolism of the north star we have the thought of a lode star, a magnetic attraction, which guides the pilgrim back home. Many esotericists hold the belief that the human family, the fourth kingdom in nature, gradually came into being during the two thousand years, approximately, when our sun was in Cancer. The thought of a mass of animals, of set boundaries within which these sheep or animals were confined, and the thought of a magnetic center of attraction, are symbolically portrayed for us also in the Masonic tradition. In Kircher's Egyptian Planisphere, Argo is represented by two galleys (as we have two sheepfolds), whose prows are surmounted by rams' heads, and the stern of one of them ends in a fish's tail. Note, therefore, how we have here held pictorially in front of us the consummation in Capricorn, wherein the goat scales the mountain top. We also have the portrayal of that greater cycle which includes the progress of the soul from Cancer to Capricorn, but which begins in Aries, the ram, and ends in Pisces, the fishes. A close analysis of the symbolism of the zodiacal signs deepens in one the strong conviction of the eternal picturing of truth and the constant holding before our eyes of the story of the evolution of matter in form, of consciousness, of spirit and of life. Argo stretches all the way from Cancer to Capricorn and is one of the largest of the constellations. It has in it sixty-four stars, of which the brightest is Canopus. Its symbolism, therefore, covers the life of the aspirant from the time he takes incarnation until he has reached his goal. We use the word "ship" quite frequently in a symbolic sense, speaking of the "ship of state", the "ship of salvation", and conveying ever the idea of security, of progress, and of the achieving of a way out, of the making of a journey and of the carrying of a vast crowd of pilgrims in search of golden treasure or a new and freer home. The pilgrims are equipped with instinct, and as they pass through the various constellations covered by this immense sign, that instinct demonstrates as intellect in a human being as he develops self-consciousness and emerges from out the purely animal stage, until the time comes when, having progressed around and around the zodiac, the aspirant finds himself again in Cancer, faced with the problem of finding that elusive, sensitive, and deeply occult, or hidden, spiritual intuition which will guide him in his now lonely journey; the aspirant is no longer identified and lost in the mass; he is no longer one of the sheep, safely guarded in the sheepfold; he is no longer one of the great herd of emigrants, but he has emerged out of the mass and has started on the lonely way of all disciples. Then he treads the path of tribulation, of test and trial, wrestling by himself as an individual, from Leo to Capricorn, until the time comes when, with the aid of instinct, intellect and intuition, and driven by the urge of the Christ life, he again merges himself with the mass and becomes identified with the group. He then becomes the world server in Aquarius and has no sense of separateness. We have seen that the hind or doe, for which Hercules sought, was sacred to Artemis, the moon, but was also claimed by Diana, the huntress of the heavens, and by Apollo. the sun god. One of the things that is often forgotten by students of psychology and those who probe the unfolding consciousness of man, is the fact that there are no sharp distinctions between the various aspects of man's nature, but that all are phases of one reality. The words instinct, intellect and intuition, are but varying aspects of consciousness and of response to environment and to the world in which the human being finds himself. Man is an animal, and in company with the animal, he possesses the quality of instinct and of instinctual response to his environment. Instinct is the consciousness of the form and of the cell life, the mode of awareness of the form, and, therefore, Artemis, the moon, who rules over the form, claims the sacred hind. In its own place, animal instinct is as divine as those other qualities which we regard as more strictly spiritual. But man is also a human being; he is rational; he can analyze, criticise, and he possesses that something which we call the mind, and that faculty of intellectual perception and response, which differentiates him from the animal, which opens up to him a new field of awareness, but which is, nevertheless, simply an extension of his response apparatus and the development of the instinct into intellect. Through the one he becomes aware of the world of physical contacts and of emotional conditions; through the other he becomes aware of the world of thought and of ideas, and thus is a human being. When he has reached that stage of intelligent and instinctual awareness, then "Eurystheus" indicates to him that there is another world of which he can become equally aware, but which has its own method of contact and its own response apparatus. It is interesting to note that during the time we say the Sun is in Leo, this year from July 22 to August 21, 2010, due to the precession of the equinoxes, and from the Earth's perspective, the Sun is actually traversing the zodiacal sign Cancer. With this consideration, we invite you to review the SouledOut.org materials on Cancer freshly, from this perspective. Harvard 1960.390, Boeotian black figure kantharos, ca. 560550 B.C.